Many of us buy those pots of antipasti in supermarkets. The little plastic pot that you fill with stuff for a two or three pounds. Well they always have marinated feta and/or olives. Well I thoughts I’d give it a go myself – for no other reason that I’d bought too much fresh feta from my local Syrian supermarket in Brentford and couldn’t feasibly eat it all before it was past it! Fortunately there was a recipe for marinated feta in Persiana by Sabrina Ghayour. This is incredibly simple and just benefits from maturing for 24 hours or so. 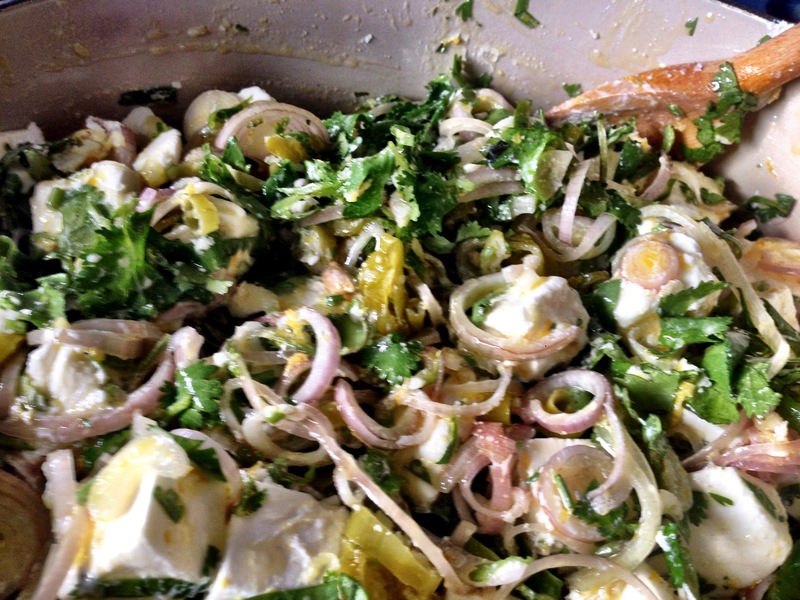 In a big bowl, cube some feta, add olive oil, garlic, pickled chillies, finely sliced banana shallots, fresh coriander, lemon rind and lemon juice and stir the whole thing together carefully (you don’t want to mash the feta). I didn’t add salt to mine – I find the feta is salty enough as it is. Once it’s all nicely mixed, decant into jars – I used the plastic pots left over from the fresh feta and seal the lid. Pop in the fridge and leave for as long as you can resist. We ate this for days! We had three or four pots of the stuff and we grazed on it, had it on toast, sneaked spoonfuls from the fridge and made it part of a meze meal. For something so simple to make it really makes sense to give it a go yourself rather than buy it pre-made for you.